Pacific Ocean Region Map of Volcanoes, Impact Craters and Earthquakes over the past 2,000 years. | Chaos Sweeps Away the World We Know! The Disaster, current events & Catastrophe Blog. Forecasts for 2014 to 2022. Read tomorrows news today! Plus current economic, commodities, stock indices and financial news. March 2, 2013 – Pacific Ocean Region Map of Volcanoes, Impact Craters and Earthquakes: The map above reflects significant volcanoes, impact craters and earthquakes, over the last 2,000 years. The tectonic plate boundaries are shown; with red representing divergent (spreading) boundaries, white displaying transform (strike/slip) margins and dark gray presenting divergent (one plate dives under another) borders. The black dots represent significant earthquakes, over the last 2,000 years. I have highlighted several notable events. The 9.1 magnitude Sumatra quake of December 26, 2004 ruptured over 1,000 kilometers (621 miles) of subduction boundary. The subsequent tsunami killed more than 278,000 people, some as far away as Africa. In the distant past, a Cascadia earthquake greater than 9.0 magnitude, drowned local coastal forests and triggered a tsunami that damaged distant Japan. 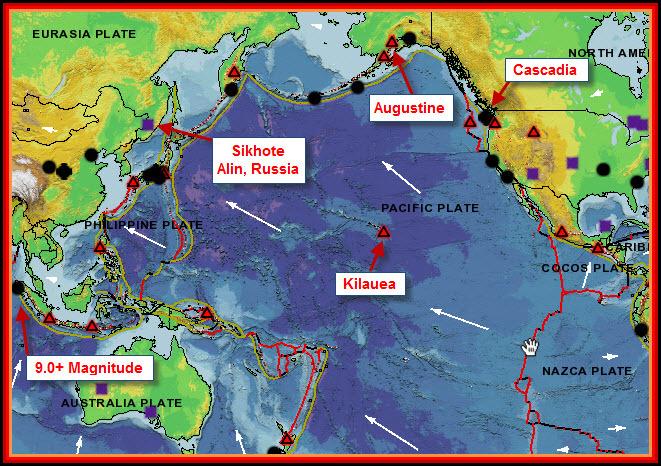 Since the Juan de Fuca subduction (divergent) fault zone has not had a major release in centuries; this is a grave threat to the United States. Now there are millions of people in this region and an earthquake and tsunami of the Cascadia event (Pacific North-West, USA) size, would be a catastrophe of unimaginable proportions. If the Cascadia event were coupled with a major release of the transform fault along the California coast, the entire west coast of the United States would be destroyed; killing over 50 million people. The Kilauea volcano of Hawaii has been erupting since 1400 A.D. and has already created 1.4 square miles of new land. On a positive note, volcanoes create very rich sole for crowing crops and produce new land. The negative consequences are well documented in the cataclysmic eruptions of Tambora and Krakatoa in Indonesia. The impact craters in Sikhote Alin, in Russia; from a large meteorite shower in 1947, left over 100 impact craters and over 8,000 meteorites. The danger from an impact by a meteorite, comet or other space object cannot be under estimated. Augustine volcano, rising above Kamishak Bay in the southern Cook Inlet about 290 kilometers (180 miles) south-west of Anchorage, is the most active volcano of the eastern Aleutian arc. It consists of a complex of overlapping summit lava domes surrounded by an apron of volcanic debris that descends to the sea on all sides. The flanks (sides) consist mainly of debris-avalanche and pyroclastic-flow deposits formed by repeated collapse and regrowth of the volcano’s summit. The latest episode of collapse occurred during Augustine’s largest historical eruption in 1883; subsequent dome growth has restored the volcano to a height comparable to that prior to 1883. The oldest dated volcanic rocks on Augustine are more than 40,000 years old. At least 11 large debris avalanches have reached the sea during the past 1,800 to 2,000 years. A major eruption in the 21st century would devastate Alaska and kill 90% of its population. The subsequent tsunami would inundate the Pacific Rim Countries, including the United States. Some believe that natural disasters are a manifestation of negative vibrations sent forth by the people of the Earth. If this is true, world events occurring now do not bode well for the globe; in terms of significant volcanoes, earthquakes, tsunamis and earth impacts from space! This entry was posted in Alaska Earthquakes, Aleutian Islands Earthquakes, Aleutian Islands Volcanoes, American Samoa, Anchorage, Apocalyse, Argentina, Canada, Chile, China, Death, Disasters, Earthquake, Events, Fiji, Indonesia, Japan, Misc, Miscellaneous, Nature, New Caledonia, New Zealand, News, Pacific Ocean, Papua New Guinea, Papua New Guinea, Peru, Philippines, Ring of Fire, Russia, South Pacific Ocean, The Kingdom of Tonga, The Ring of Fire, The Sandwich Islands, The Solomom Islands, United States, Venezuela, Volcanoes and tagged augustine volcano 180 miles southwest of anchorage alaska could destroy alaska and part of canada, calfiornia transfor (strike/slip) fault would destroy california and kill over 50000000 people, Cascadia earthquake in the U.S. northwest could destroy seattle washington, Earthquake, hawaii, Impact crater, impact craters at sikhote alin russia in 1947 had over 100 impact craters and left over 8000 meteorites, Kamishak Bay, kilauea volcano has been erupting since 1400 A.D., krakatoa volcano, natural disasters manifest from negative vibrations sent forth by the people of the world, pacific ocean, pacific ocean region map of volcanoes impact craters and earthquakes over the last 2000 years, plate tectonics, sumatra december 26 2004 ruptured the subduction boundary for over 600 miles and killed over 230000 people as far away as Africa, tambora volcano, tectonic plates divergent transform divergent, The Master of Disaster, The Ring of Fire, United States, volcano. Bookmark the permalink. 1 Response to Pacific Ocean Region Map of Volcanoes, Impact Craters and Earthquakes over the past 2,000 years.